Wildcard Certificate, On request ? If you need a safety certificate for multiple subdomains in a domain, then the Wildcard Certificate is the perfect choice. 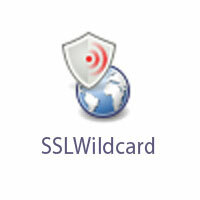 The wildcard certificate is a unique product that enables certification pollapon subdomains in a domain through a single certificate. It can be used to certify a website (e.g. http://www.yourcompany.com/) and all the subdomains (e.g. shop.yourcompany.com, pay.yourcompany.com etc.) with a single certificate.